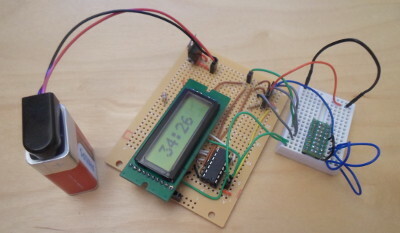 The goal of this project was to create a timer circuit, and for various reasons I decided to base it around the PIC16F630 microcontroller and use a small LCD display to show the time. In practice it would turn out to be a refinement of my previous LCD display project, which even though this was not the intention, was something I probably would have done sooner or later. I feel the main contribution of this article is understanding of the timers available in PIC16F630, rather than how the time is displayed. In de-facto revisiting LCD displays, which was something that pulled me towards electronics in the first place, I got a feel of how much I had advanced in understanding. Three months ago just getting output to display at all was fulfilling an ambition with a lot of history behind it, but now I consider it to be part of a larger goal. It also feels a nice diversion from all the LED pulsing of the last few months. I had considered LED displays for the time display, but the practicalities felt too much like stuff I had done recently. 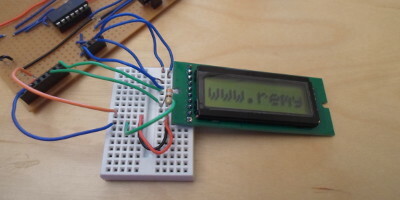 In theory it was possible to read the LCD busy state, but in practice it never seemed to work. This time round I simply hard-wired the read/write to always be write, accepting that I would rely entirely on delays in the firmware code. Contrast control never really worked as advertised — I had tried making a fixed potential-divider out of resistors, but getting things to show involved instead attaching the pin to just ground. In the end I decided to use a strong pull-down (390&ohm;) rather than a direct attachment, but having the resistor did not seem to make much difference. The delays in the previous project were excessive, as only a few operations — mainly used on start-up — needed to be of the order of milliseconds, so I changed them to delays nearer what was actually required for individual operations. In the process I also used a cleaner approach to implementing the waits. The start-up procedure was not entirely reliable in getting the LCD display into 4-bit mode, so it sometimes failed. This fault was rectified. Most of these I probably should have done first time round, but that the time I was only after proof-of-concept. This time round I was building a practical circuit where performance is more of an issue. Although I was building the hardware, I was expecting much of the effort to be in writing the firmware, so I constructed an equivalent circuit in gpsim for this purpose. It is in fact the layout from the previous LCD project, modified to add buttons, although not all the button functions were implemented in the end. One annoying feature of the buttons is that they were toggle rather than press-to-make, but in itself this was not a major problem. I have been critical of gpsim recently due to the number of bugs I unearthed, but in this case I consider it to be an uncompromising help to what I was trying to achieve. Without it I doubt I would have made such rapid progress, and anyone reading this article would have to buy hardware to actually try out the stuff mentioned. Although the purpose of this project was to try and use up the stock of PIC16F630 microcontrollers I had bought a few months back, I finally concluded that they are simply too unreliable and ended up buying a new stock from Farnell. The existing stock was mostly ordered from China, and at the very least I suspect a few were equipped with some sort of non-erasable (or at least, non-electrically erasable, such as EPROM) flash memory. I also suspect some may only have been 3.3volt tolerant, and/or possibly damaged in transit. Whatever the cause, they seemed to be a constant headache in a way none of the other PIC microcontrollers I had used were. To be fair almost all the other stuff I ordered from China over E-bay has turned out fine, but integrated circuits specifically have been an almost universal disaster. The price saving is simply not worth either the problems or the shipping lead-time — assuming they arrive at all. They might just about be OK for a production run when a faulty unit can easily be spotted, but for development & experimentation when tolerances are likely to be stressed they are not worth the hassle. Rather than giving one long code listing, I broke the firmware down into more sub-functions than strictly required, so I could explain the specifics of each. I omitted a few minor functions such as incSecond() & setAlarm(), but the absence of these functions should not affect the understanding I am trying to present. The actual focus is on timer control and correct LCD signalling. For my previous LCD project I used a single delay for all LCD operations, and by any measure it was too long. This time round I deciced to have two delays, as not all operations need a long processing delay. For the longer delay I decided to use the Timer0 module, which made use of actual timing circuitry, rather than using nested busy-loops. When the timer is running TMR0 gets incremented, and the interrupt flag gets set when it wraps around from 255 to zero, so most of the time in this fucntion is in the empty loop that constantly checks for the interrupt. The bottom three bits of OPTION_REG set the frequency-division of the input into Timer0, and the highest value of 0b111 corresponds to 256us per increment (the PIC16F630 has a fixed & calibrated internal clock of 4MHz). Using MOVLW 249 would result in a delay of 1ms, which is close to the upper limit of what this loop can do due to the 8-bit word size, but delays of this length is where I prefer to make use of timer interrupts rather than busy loops. The loop parameter iTic has to be a global variable, but SDCC conveniently makes it available using the macro _iTic. Although I think only some of these operations need the full 1ms delay of lcdBangNibble(), the extra wait does not matter for a one-off startup procedure. The main trick is forcing the LCD display into 8-bit mode, a trick I pinched off Wikipedia, so that the switch to 4-bit mode is from a known state. Whereas Timer0 is used for LCD delays, the much higher-resolution Timer1 is used for delays related to button presses and actual timing. The resolution of this timer — independent of Timer0 — is set by two bits within the T1CON register, and here the maximum 0b11 (division by 8) is used. When a button is pressed, the a timeout is set using the following function. The handling of button presses consists of a race between the button being released, and the timeout interrupt from Timer1 occuring. 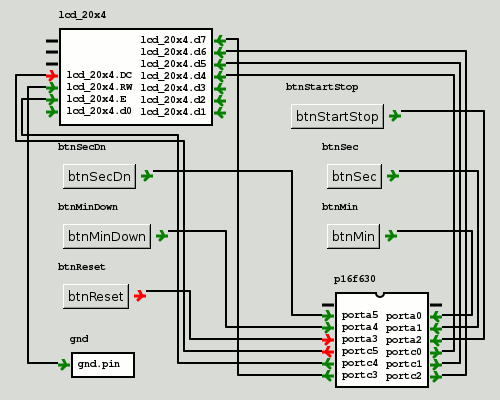 If the button has been released — detected by a pin-change interrupt and then checking the relevant pin itself — the timer is cancelled. Otherwise a new timeout is set and the return value indicates a time-based increment/decrement should occur. When actually counting down real time, the following is used which sets a nominal 500ms timeout — on hardware it might need adjusting using experimentation. This is close to the upper limit of what the timer can count, as the combined values of TMR1H & TMR1H are 0x0bdd, and the timer increments this value. I added this as a sanity check for debugging purposes, as unlike simulation actual hardware is somewhat unforgiving to the absence of pull-up and pull-down resistors, and it helps narrow the problem down to a floating pin. If not all the input pins are held low, it dumps the PORTA status to the display. The main body of code is mainly a state-machine and is really only included for completeness as all the interesting things are delegated to functions shown above. It is not as robust as it could be, most notably to pressing multiple buttons at once, because such robustness if beyond the scope of this article. I had considered using interrupt handlers, but splitting interrupt processing between those that are checked from the main code body and those that are handled in a call-back simply over-complicated the design. I opted for checking of interrupt flags within the main body of the firmware because it is an event-based approach I am used to, and it got around the course-grained options for choosing what interrupt flags cause an actual interrupt call-back. This project would have only taken 2-3 days but it was beset with problems, some of which were due to dodgy micocontroller chips, and others due to the poor soldering characteristics of the wire I was using. 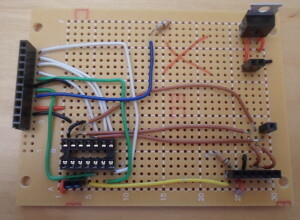 The board is shown below, top-side to the left without the LCD display in place so the wiring can be seen, and under-side to the right. I took less up-front care with this board than previous ones, but I think the only fundamental fault was the bare ends of some of the brown wires. My original intention was to attach buttons directly onto the circuit board, but I never got round to this, and instead I added receptacles for the input pins that were not already connected via the reprogramming port. This is somewhat ugly, but by this point I thought the circuit may have problems, so that any further additions should be done in terms of expedience rather than attractiveness. On more than one occasion I had come close to discarding this board and starting over, but in the end traced problems to elsewhere. Below is picture of the circuit in full working order. The white breadboard contains pull-down resistors (using my SMD resistor array), and I used a fly-lead attached to Vcc rather than wiring up some buttons — for some reason obtaining push-to-make buttons is a lot harder and more expensive than it should be, and I decided not to let a lack of them hold this project back. In any case the focus of this project was on the firmware rather than the hardware, so although it was not complete in the sense of having buttons to press, it was functionally complete. This started out as an excuse in trying out a new breadboard, but in the end turned into a re-run of an earlier display project. It was helped by having a working circuit as reference, which allowed me to take a few short-cuts compared to my previous circuit design process, but it also meant restocking hardware I did not really want to restock. Below are various remarks regarding what I got out of this mini-project. The breadboard was nice in terms of not having to drill out tracks, but on the whole it was that bit disappointing. I knew that the wires I was using are poorly suited for soldering, but they seemed notably problematic with this board compared to be usual strip-board. 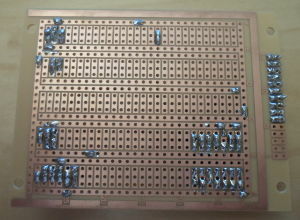 This board is advertised for use with integrated circuits, but it could really have been 5 holes taller, allowing for three rows of chips rather than two. This was one thing that put me off using 7-segment LEDs. The PIC16F630 does not seem to have any internal pull-up on the MCLR pin, and not having an external pull-up was a source of all sorts of problems with my earlier firmwares that still had MCLR set to the default enabled. Even though I disabled MCLR to allow a sixth input, I did not use the extra button in the end, and my inclination is to avoid using the pin anyway. More generally actual hardware (unlike simulations) is very unforgiving to floating inputs, leading to all sorts of strange results, which did not really affect me in the past as this is the first circuit I made that actually uses input pins. As an initial test I compared the timer — both simulated and flashed to hardware — to a 50-minute countdown on a stop-watch. Under gpsim simulation it was reasonably accurate, but the hardware was fast completing the countdown in around 46 minutes. I rectified this by adjusting the values in setTicTimeout(), but it was somewhat trial-and-error. The chip clock is supposedly calibrated to quite tight margins, so the initial margin of error of almost 10% surprised me. As a follow-on I had thought about using a chip with I2C capabilities, but then I realised I was already most of the way towards reimplementing the display modules I used back in the days I worked in Bristol. I have already all the pieces — LCD output, button input, UART usage, and RS232 wire driving — it would just be an issue of bringing them all together.